The God of Isis is renowned for the protection of health, marriage and love. You will have a very healthy shot and fall in love with this game; which is sure to bring you an additional benefit of happiness. An Egyptian setting opens up a range of opportunities for you to win massive cash prizes here at Mega Reel. 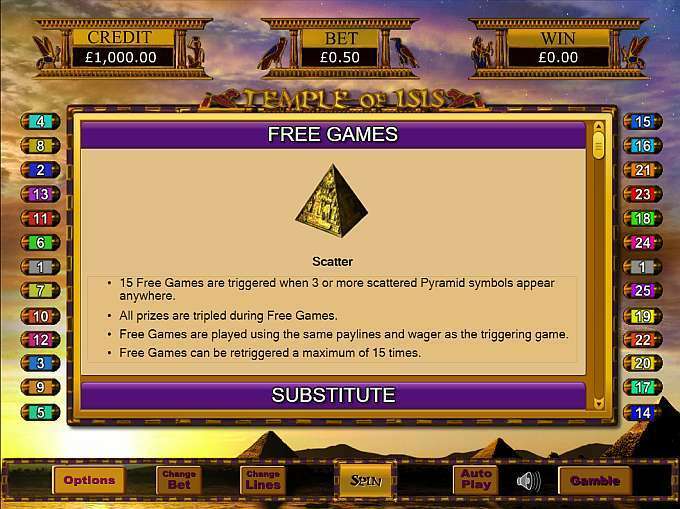 ‘Temple of Isis’ is a 5-reel, 25-paylines no deposit slot game brought to you by the ever popular Eyecon. This development team became established in 1977, giving them plenty of experience. Eyecon are regarded as one of the best in online slot creation and include a host of well-known and popular titles. Based in Brisbane, Australia, Eyecon have successfully delivered games and software that has been integrated throughout industry standard with ease. Browse the 666 platform to find even more smashes by this high-quality developer. There is an average return of around 95.05% within this title. You can select and amend both your lines and coin values throughout this game. Your minimum bet is from 1 to 50 coins per line. AUTOPLAY is available should you wish to take a more relaxed approach to this royal title, selecting from 10 to 500 lines per spin. Similarly, you can also select MAXBET to maximise your winning potential and play at the highest level. Eye of Horus; a symbol of protection, royal power and good health. Further generic high symbols are the 9, 10, J, Q, K and A. WILD – One of the highest paying symbols and your wild is the ‘Priestess’. The priestess substitutes for any symbol (bar the scatter). 5 wild symbols in a winning combination award up to 9,500 coins! SCATTER – The ‘pyramid’ is the scatter within this title awarding wins no matter where its location is on the reels! FREE GAMES – ‘The Temple of Isis’ also features a free games bonus round. 3 or more scatter pyramid symbols will trigger your FREE GAMES feature with up to 15 free spins with a x3 multiplier. More free games can re-trigger throughout the bonus game. 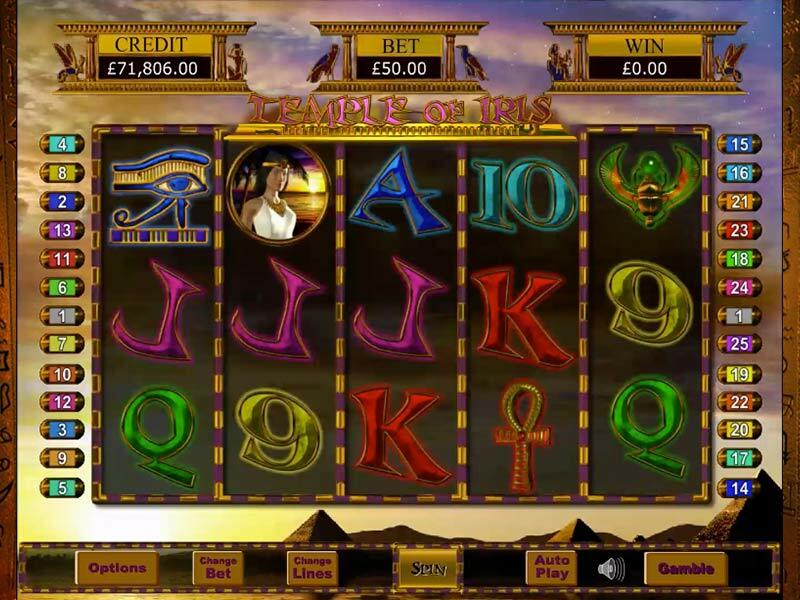 GAMBLE – additional to Temple of Isis is the Gamble feature. Guess the card correctly and be awarded with a double on wins. Better than that, guess up to 5 correct cards and be at a potential of reaching the max win of 3, 000, 000! You can choose to exit and take your winnings at any point throughout the gamble round. A tale of honour and health. The developers at Eyecon have gone all out with this generous slot, fuelled with ancient Egyptian artefacts and profitable wins. It is a treasure of a slot which will have players on the edge of their seats, throughout. The gamble feature really sets this slot apart with opportunities to manage your fortune throughout. You may also want to try Temple Of Ausar Jackpot!